Contemporary Lit was where I first was introduced to Vonnegut. (We also read Kerouac, Kosiński, maybe some others.) I wasn't impressed with any of them: I thought they were all a bunch of irrelevant weirdos who were anything but contemporary. The Vonnegut was of course Slaughterhouse-Five, a novel I was surprised to find had nothing to do with mass slayings by a deranged faceless killer. Instead there was a meandering plot and aliens described as looking like toilet plungers. I guffawed at the stupidity. For years, I'd tell people who hadn't read the book about the Tralfamadorians. But here's the thing about Slaughterhouse-Five: it stuck with me. I remember more about that novel than I do some novels I read three weeks ago. And so it goes. Eventually I became a all-caps, italicized READER; I finally read that one work that convinced me the world of stories was a world I wanted to live in. And once I entered that world, the name of Vonnegut would pop up often: writer's workshops and Internet searches; book recommendations and some of my favorite hip-hop songs. Over and over, I found like-minded people loved Vonnegut, so I thought maybe I should too. It has now been more than twenty years since I was first introduced to Vonnegut. 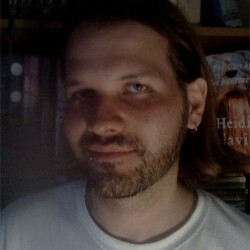 Despite my intentions to explore the author in the last decade, I have failed until now. Every time I picked up any Vonnegut novel, I would find myself distracted with something shinier or more promising. 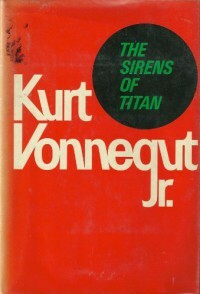 I finally decided I'd read The Sirens of Titan because I have a fascination with Saturn's moon and because Vonnegut himself liked the novel (when grading his works years later, Vonnegut offered an 'A' to his sophomore novel: https://en.wikipedia.org/wiki/Palm_Su... ). Even then, it was some years before I finally read the damn book. But here I am, finally, at my destination. Malachi Constant is also a man without direction. In a novel which promises to send the rich astronaut to Titan, he first makes prolonged stops to Mars, Mercury, and back to Earth. Along the way he loses his memory, loses his hope, and loses himself. I feel I can relate in some ways with Malachi Constant. As with all classic novels of spaceflight, The Sirens of Titan is a horribly dated book. Unfortunately, it is more out of touch with its misogynist and prejudiced treatment of its characters than with the technology involved. The main female character—now that I think about it, she may have been the only female character—is reduced to serve as chattel, nameless for for too long. It doesn't feel so out-of-place in a science-fiction novel published in the 1950s, but it does sixty years later. Let's just sidestep that issue and look at the book as a whole, shall we? Vonnegut doesn't give justice to any of his characters really. They're all rather shrewd and built on stereotypes, but it matters little as they're devoid of dimensions. Though this is only my second Vonnegut, I'm already beginning to see that characters and language take a back seat to plot, but that even plot is secondary to ingenuity. Vonnegut was a clever author. Vonnegut strikes me as a more modern and less showy Mark Twain: of course Twain largely wrote about history and his own world; whereas Vonnegut wrote about future and worlds other than his own. Vonnegut weaved wit with seemingly little effort and I think this is was makes his stories so likable. Though there are clever remarks and situations throughout The Sirens of Titan, the author did not jump in after every passage to say, “Did you see what I did there?” He trusted the reader to figure it out, or perhaps he figured if the reader didn't catch his humor, it wasn't worth his effort to explain it. I walk away from The Sirens of Titan with similar, but more mature feelings as I did with Slaughterhouse-Five twenty years ago. I really wasn't that impressed. As a reader whose first love is characters and their development, I found The Sirens of Titan to be greatly lacking. While reading the novel, I was conscious of the fact that I found the story to be ridiculous if not outright cheesy. Yet, I continued to read with great interest. And, once again, here I am weeks later, remembering details of Constant's journey that I would've struggled to recall from parallel journeys written by other authors. So, I'm still not sure what I think about Vonnegut. I sort of liked this adventure. I sort of wondered what the hype was about. But I would give him another try. It could easily be another twenty years, but what is time in the world of Vonnegut?